Website accessibility is a growing trend, and for good reason. 56 million Americans report having a disability, and most websites do not properly address the needs of users with physical, cognitive, or technology impairments. But, choosing to make your website more accessible isn’t just a way to serve more customers. Implemented correctly, website accessibility is a major boost to your search engine optimization (SEO) program. Background on SEOSEO is the practice of increasing website traffic from major search engines. A large portion of growing this organic traffic is having a website that meets SEO best practices. These best practices range from quality content, to technical soundness, to best practices in design. Born from the Rehabilitation Act of 1973 and the subsequent Americans with Disabilities Act of 1990, website accessibility didn’t really begin gaining ground until 2006 when, in response to lawsuits, the Department of Justice began looking at websites as places of “public accommodation” – just like a brick-and-mortar business. In general, website accessibility refers to making a website usable by all people, regardless of ability, education, or technology. Optimizing for website accessibility can be complicated because there’s a lack of clear standards, and many decisions are subjective. Are these obvious? Yes, and that’s the point. Your website isn’t a place to experiment with out-of-the-box designs. It’s a place to inform and serve your customers. Good user experience (UX) design puts the user first. In short, the goal of accessible web design is exactly the same! Think about it: legible text is important for users with visual impairments. Straightforward navigations help users with cognitive impairments and users navigating your site with their keyboard. Quick load times serve users without access to high-speed WiFi. Google has made it clear: websites that give users a better experience will have more search visibility than websites with poor UX (In fact, here’s a 160 page PDF from Google that talks about quality content!). 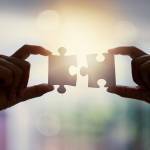 Is “User Experience” a single ranking factor? Probably not, but lots of elements of good user experience are. For example, Google has clearly noted site load time, mobile friendliness, content, and internal linking all play a role in SEO. Best practices are called “best” for a reason. Stick to them, and your site will provide an experience that serves your users and search engines alike. Title tags are part of Web Development 101. They are exactly what you’d expect: a way for you to give a title to each page on your website. Title tags are not visible on the page of your site itself, but instead, are present in two locations: the tab at the top of your web browser and (more importantly) the results page of a Google search. Title tags are crucial for SEO, and one of the primary areas in which your content should match your users’ intent. It is not a coincidence that all page-one organic links on google searches for “best mattress” have a title tag with that exact keyword. 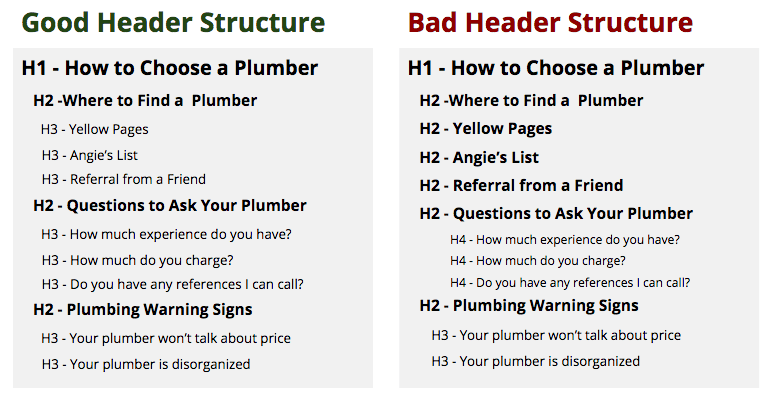 Header tags define the hierarchical structure of a website page in much the same way we learned to outline our essays back in high school. There are six levels of header tags running from H1 to H6. Users with cognitive impairments or limited reading comprehension can use clear headers to decide which sections are worth reading and which are worth skipping. Additionally, users relying on a screen reader need a thoughtful header structure to have a good website experience. This is because their screen readers allow them to skip through headers until they find the section they want to read (just like sighted users would quickly scan a page). Without a doubt, content that matches a user’s intent is one of the most critical elements for good SEO, and headers are a critical element in creating that content. Google directly says that “it’s always beneficial to…break your content up into logical chunks.” (Source: Google). Additionally, good header structure can help you win featured snippets or “instant answers” that give answers to users without clicking on the link. 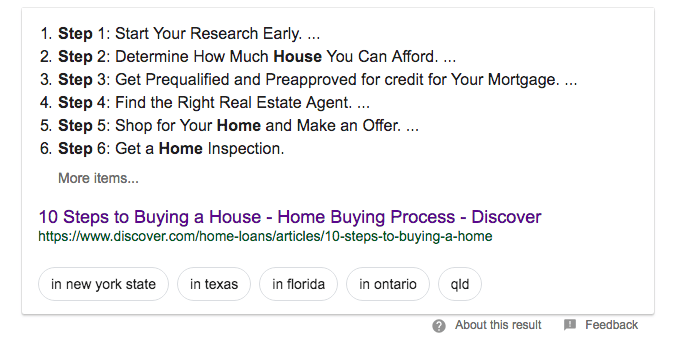 Discover has claimed the featured snippet for “steps to buying your house.” The steps displayed in the snippet are the H2s on their page. Alt text is used to provide a textual alternative to all visual elements on a page. This typically applies to standard images on a page, with file types like .jpg, .png, or .gif. Alt text is different than a caption. Captions are visible to all sighted viewers of a web page and sit below an image (obviously, screen readers can access these as well). Alt text describes the image on the back-end and is not visible to a sighted viewer on your website. Alt text is one of the most basic and most important accessibility needs. It’s even addressed in section one of the WCAG guidelines: “non-text content that is presented to the user has a text alternative that serves the equivalent purpose.” Alt text is read aloud by screen reader technology to provide context about images to users with visual impairment. Just as with page titles, alt text needs to be accurate. When writing image alt text, think about how you would describe the image. 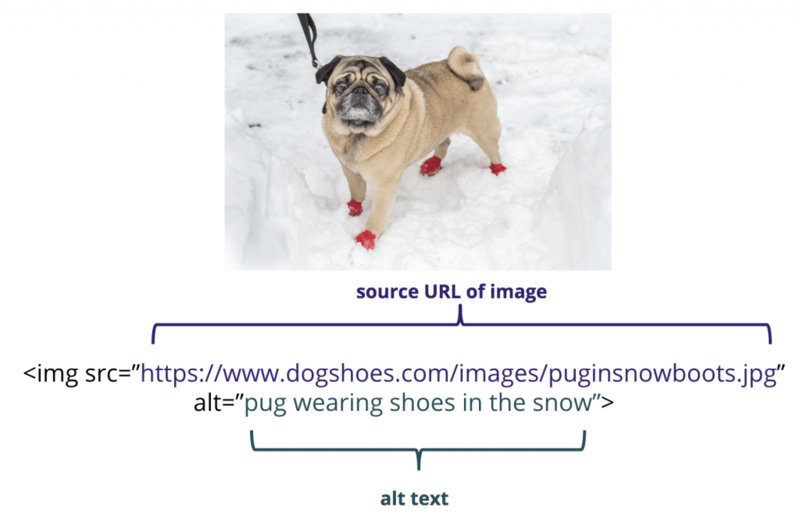 “Pug wearing shoes in the snow” is good alt text. “Dog Shoes for Pugs | Shop Dog Shoes for All Breeds | Boots for Your Dogs” is not good alt text. Search engines look for alt text on images and controls within a web page. Alt text provides further information to search engines about the content on your site. That makes it a smart choice for SEO. Moreover, if you want the images on your site to show up high in Google Image searches (a massive opportunity for many companies), alt text matters. Read more about Image SEO in this article from Moz. Link anchor text is the highlighted, “clickable” text on a website. You might think of it is as the blue, underlined text on a site (although text in a navigation is all link anchor text, as well). Just as with alt text, the purpose of optimizing your anchor text is to ensure that the link is presented to the user with relevance and accuracy. Good link anchor text gives users an accurate expectation of what to expect on the page you are linking to. Users navigating via keyboard or via screen reader technology often choose to browse a site by skipping from link to link. Because these users are frequently not reading the sentences before or after a link, having quality link anchor text ensures that these users know where each link is pointing. A video transcription is a text-based description of a video file. Videos of interviews or of people talking typically need transcriptions of what’s being said. Videos that are describing a process need transcriptions that describe the process. Videos that are just visually striking need transcriptions that describe what the visuals are trying to convey. For pages on which the video is the central piece of content (e.g. a blog post with a video of a conference presentation), putting the transcription on that page, below the video, is standard. Plus, videos are increasingly important. Cisco predicts that by 2020, up to 82% of time on the internet will be spent watching videos. Although search engines are getting smarter, they are not listening to your videos and indexing what’s said. When videos have engaging, interesting content (especially on educational and informative content), providing a transcription on the same page as the video is critical. Moz creates a weekly blog series called Whiteboard Friday that provides great transcriptions. 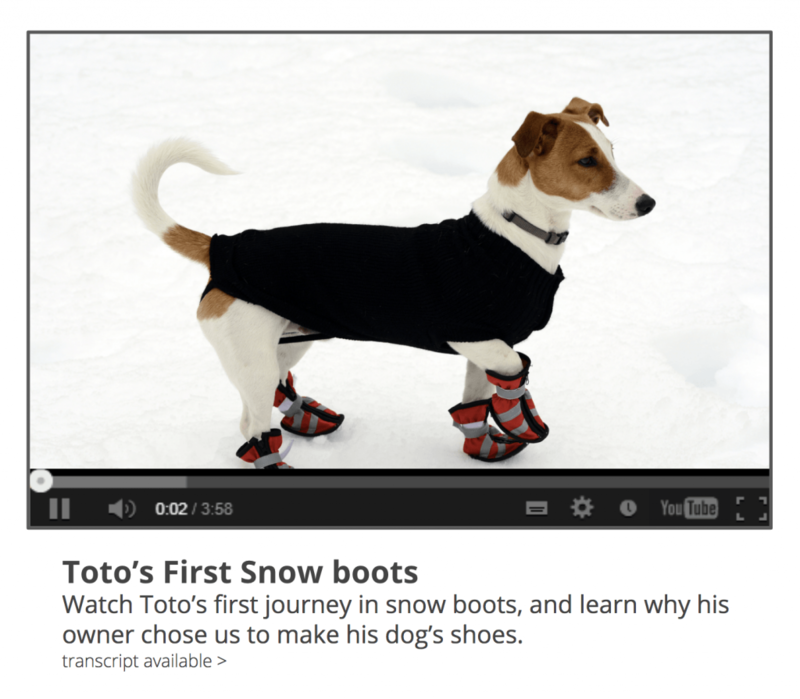 See an example of great video transcription here. The benefit here is obvious: video transcripts make video content accessible to a far broader base of people. Schema.org is a programming vocabulary that helps better define elements and content on a web page. Developed by Google, Microsoft, Yahoo, and Yandex, schema is an almost universally accepted way to help search engines understand your site’s content. There are hundreds of schema tags available for use, with more added every year. See the full list on schema.org. Screen readers rely on code that accurately describes the content being displayed on a website. For standard website content, typical semantic HTML tags (like h1 and title) typically suffice. But, websites with more advanced content and features need additional markup. These features are frequently found on websites with dynamic content, e-commerce functionality, and large quantities of published content. Schema markup is “one of the most powerful, but least-utilized forms of SEO available today,” according to many top SEO experts. There is no evidence that schema markup has a direct effect on website rankings, but there is plentiful evidence that schema markup improves click-through-rate on your pages. This is largely due to the fact that schema tags can add rich snippets to your results in search engines. In a search for “blackberry cobbler recipe,” Betty Crocker’s search result has a number of unique features: star rating, number of reviews, time to complete the recipe, calorie count, and three related recipes. These all come from schema.org markup, and they all result in more traffic to your website. You’ve seen them in the footer of most websites (including ours! ): a link to a “Sitemap.” The page works mainly as an outline of the various content on your website, with links pointing to the various pages. Sitemaps are a straightforward concept. Most CMSs have plugins or modules that will update your HTML sitemap automatically as you add more content, keeping you from having to frequently update them yourself. Users with visual impairments often choose HTML sitemaps to navigate through a site. These pages give users an easy-to-navigate, big-picture overview of all site content. This is especially helpful for websites with important interior pages that are not accessible via the primary navigation. One of the most crucial elements of a site well-optimized for search engines is taking the steps to ensure search engines find and index all the pages on a site. Occasionally, pages can be missed or ignored by search engines. HTML sitemaps are a great way to provide search engines a list of all the primary content on your website. When the search engine crawler finds your sitemap, they’ll also find all the links on the page (and thus all the pages your sitemap lists). Despite being separate disciplines, website accessibility and SEO are mutually beneficial. The better your site serves all users, the better it will serve search engines, too. If you’d like to talk further about website accessibility and how we can help you to improve your SEO performance, please feel free to reach out and contact us. Copyright © 2019 DBS Interactive. All rights reserved. There are errors in the submission.